While switching from processed food to nourishing food doesn’t have to be terribly expensive, there’s no way around this one: White and brown sugar are cheap. Sucanat, real maple syrup, muscovado, honey, and stevia are not cheap. I can get a 2-pound bag of brown sugar at the store for $1.78. Sucanat, on the other hand, is usually $5.00 for 1.5 pounds. Ouch! It’s worth it to buy the good stuff, but it isn’t fun to pay for. While I don’t have any earth shattering advice about finding fantastic deals on these wholesome sweeteners, I do have some suggestions based on what works for me. 1. Stop eating so many sugary desserts. I know. You’re rolling your eyes. I feel your pain on this one because I’m a recovering sugar addict. Pray about this and let God’s power be your will-power. You don’t have to cut out desserts altogether (unless you feel called to). You simply need to keep sugary foods a treat instead of pouring on the sugar like it’s a food group. 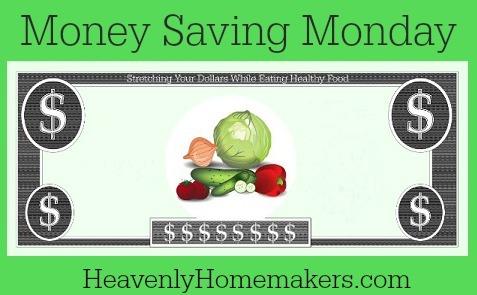 You’ll be amazed at how much money you save on sucanat, honey, and maple syrup when you stop eating so much. 2. Cut the sugar in half. When baking muffins, quick breads, and breakfast bars, I find that half the sugar called for in many recipes (even mine!) works just fine. The baked goods are still sweet and tasty. This saves quite a bit of money on wholesome sugars! Dousing your pancakes or waffles in real maple syrup? That’s an expensive breakfast! A little drizzle of rich, flavorful maple syrup goes a long way. It’s also fun to pour a tiny quarter-sized bit of syrup onto your plate, then dip the corner of each bite to sweeten it just a touch. 4. Pull out the cheap stuff when feeding a crowd. It’s all sugar. Sucanat is healthier because it’s processed very little and still contains nutrients. Real maple syrup is straight from the tree. Honey is made by bees and is as natural as it comes. But to our bodies? It’s all sugar. Read this post about Breaking Free of Sugar Addiction for more of my thoughts on this. This means you may decide that switching to sucanat (and paying the higher price tag) is just not worth it. I believe the bigger focus needs to be on cutting back on sugar (in all its forms). Focus on filling up on fruits and vegetables instead. You’ll be amazed at how sweet your fruits and vegetables taste when your palate isn’t coated with a cookie. I’d love to hear your thoughts on this. Which sugars do you choose to purchase and use for your family? Out of control sugar cravings can indicate that the body is too acidic. Getting the body alkaline takes away the crazy sugar cravings. Health food stores carry ph test strips that are helpful in determining that. It is very important for overall health. Green powder drinks and alfalfa capsules along with adjusting the diet can get the body alkaline again. There is tons of information on this online. This is not my idea. I read it somewhere online, I don’t remember where. I actually don’t care for straight maple syrup on my pancakes, but I love the flavor of 1/2 maple syrup and 1/2 butter. It helps stretch it a little farther, too. Also, most of the time we have dessert once a week. My family looks forward to “dessert night”. What about coconut sugar? Is that okay to use? I stopped buying anything with artificial sweeteners and/or corn based sweeteners. It needs to have just plain sugar in it, or we don’t buy it. I also check the qty per serving to make sure we are not getting too much sugar. Homemade is definitely best. We’ve been cutting cut the sugar in my recipes by 1/2 or more for a few years now and we are used to it. The best syrup for pancakes is either maple or homemade. To make mine, I put a couple cups of mashed blackberries and about 1/4 cup sugar in a pot, bring it to a boil, then add some cornstarch to thicken. Serve warm – Yum! When I switched from using regular sugar to using organic sugar, maple syrup and honey, I definitely felt sticker shock. That being said it prompted me to use added sweeteners more frugally. I also switched to making dessert once a week. I now limit sugar for health reasons as well. (AHA recommended daily limit of added sugar is 3 teaspoons for kids, 6 teaspoons for women, 9 teaspoons for men). On the plus side, I now feel many foods feel naturally sweet or require less added sweetener then the recipe calls for. I find that warming maple syrup makes it thinner so we use less on pancakes. Also, I pour the syrup on my kids pancakes before passing them out. Although stevia isn’t cheap, it is frugal in the sense that you little of it. Often for baking I will use half the sweetener (which is about 1/3 of normal recipes already) and add stevia to fill in sweetness. I don’t care for stevia plain but mixed with a sweetener it can be pretty good and help stretch other sweeteners. I use sucanat, honey, maple syrup, and stevia the most for us. If I am making cakes, pies, and whatever for others I just use white sugar. Why should I spend more if they don’t use it at their house to cook with? I do eat white sugar in bought things, but I hardly ever make us desserts with it. I use rice malt syrup which is a mild sweetener that is only made from rice and water and it doesn’t give you the sucrose blood spike. I make a bunch of sweet snacks with this that I freeze to have one or two if I feel like it with a cuppa or after dinner. Because they are sucrose free your body does crave more so one usually does it for me. At the moment I’ve got brownies, choc hob nobs, carrot cake, coconut cake and choc chip cookies in stock and they are all sugar free, very low sugar (from the dark chocolate) but definitely not fat free. That being said I’ve lost 4 kgs in the past 5 months just from this change. I used to be a sugar junkie but now I’ve lost the taste for it. I’m nt strict with it and I still eat fruit. So yeah… Rice malt syrup! I have some coconut palm sugar. Have you ever used this? Is it used like regular sugar? Do you have a favorite brand of sucanat? 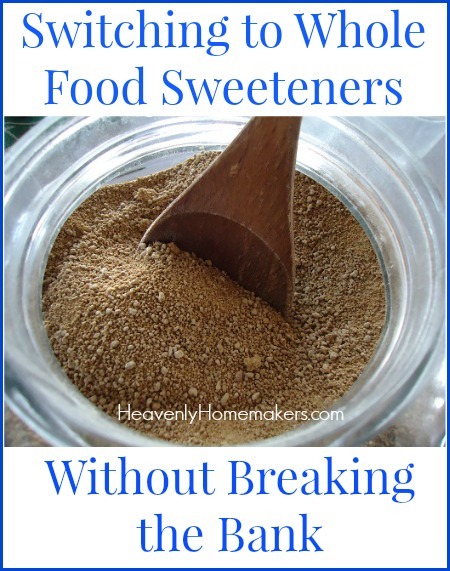 Laura, I know you’ve mentioned the possibility of cutting the sweeteners in half in some of your recipes. It would be really helpful if you would let us know which of your recipes you CAN’T skimp on the sweetener. I know you can’t go through all of them and change them, but it would save some time and money with experimenting if I knew which ones absolutely had to have the same amount of honey/syrup/sucanat. Any chance of a list of your recipes that will flop without the same amount of sweetener? In all of your spare time, of course! I am single so I’m not baking for a family, but I do like to have guests, bake for the neighbors and the church missionaries, etc. I buy organic evaporated cane juice at COSTCO, $11 for a 10 lb. bag, best deal I have found anywhere. I cannot find organic brown sugar for a reasonable price anywhere, so when I need it I mix the costco sugar with organic molasses that I buy from the discount grocery store for about $5 for a regular sized jar (the discount store usually rotates most of their items, so you can’t count on finding the same thing more than once, but this is something they always seem to have). I also get maple syrup from COSTCO, 1 qt. organic for $13. I get local raw honey from WINCO. I usually don’t shop there because they don’t have the organic options that I want, but honey is something that I do go there for. I think it’s a quart that I get for $15, I like it for the allergy benefits. I know that none of these things are cheap compared to the white processed options and Aunt Jemimah, but it’s much more reasonable than you see elsewhere. Most of the time when Laura posts a “deal” on here I find myself thinking “You pay THAT much for that??? ?” I’m lucky to live in an area where I can find plenty of affordable healthy foods. I use raw sugar as it is cheaper than Sucanat, but still a tad healthier than the regular kind. I use organic sugars when I can and honey. I always cut the sugar in my recipes (by 1/3 to 1/2). I started slowly and began cutting back more and more. At first, the family balked a little, but we adjusted quickly. Now when we eat store bought goods, they are overwhelmingly sweet to us. Moderation is also key. Desserts can’t be nightly and be frugal. I try to limit the number of times a week I make dessert to keep our costs down. Thanks for the post, Laura!